December 16, 2016 By Allyson 55 Comments This post may contain affiliate links. Read my disclosure policy. When I first read that you could make cake in a slow cooker, I really didn’t believe it…I’m not sure why, but probably because I am terrible at real baking, and this seemed like a major shortcut. 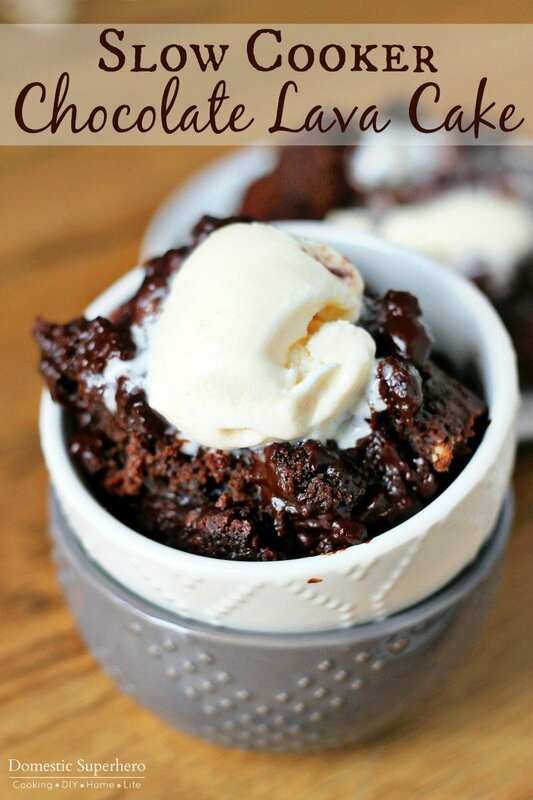 I decided to try out a Slow Cooker Chocolate cake, and made it lava style – Slow Cooker Chocolate Lava Cake. While this Chocolate Lava Cake was baking away in the slow cooker, I was shocked at the aroma that was filling the house. My son kept asking me, “mommy, what is that smell?!? !” and then when I told him what it was, he would squeal with glee at the prospect of getting to eat chocolate cake even though we weren’t at a birthday party. I was squealing right there with him. After 2 hours my Slow Cooker Chocolate Lava Cake was done cooking, and I will admit, it looked kind of weird in the slow cooker. It didn’t look great, and I was anxious about how it had turned out…could cake really be cooked, and cooked well, in the slow cooker? Once I dipped the serving spoon through the cake though, a flood of chocolate sauce came flowing to the surface, covering the cake. OOOOOOMMMMMMGGGGGGG!!!! I did it!!! It was a slow cooker success!!! I’ll admit, this cake was really hard stage for photos, and part of being a food blogger means taking things that might not look great, and making them look great. This cake was really hard, even though it was SO delicious, it was really hard to make it look perfect so to speak. 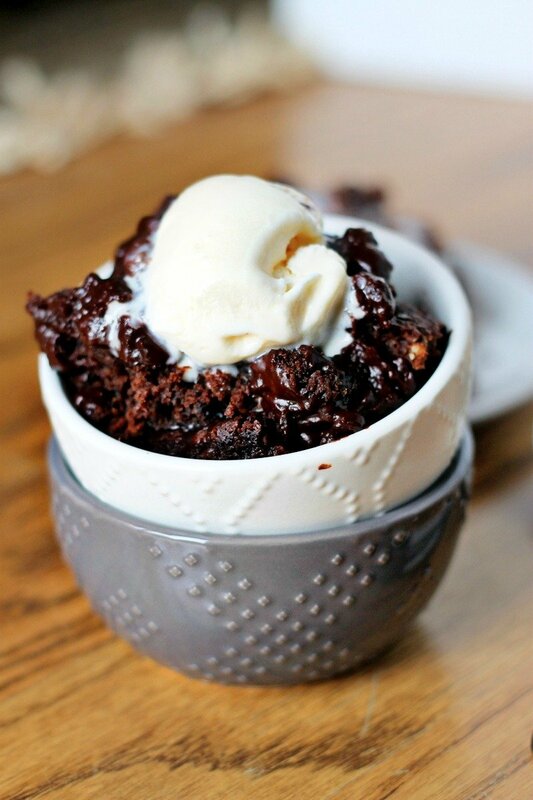 I shot it a couple different ways, and liked how it looked both ways, even though I still feel like the photos don’t portray the monumental deliciousness of this Slow Cooker Chocolate Lava Cake. Make it- I know you are probably feeling skeptical, just like I did, but just come back here after you made and and comment telling me that I was right! 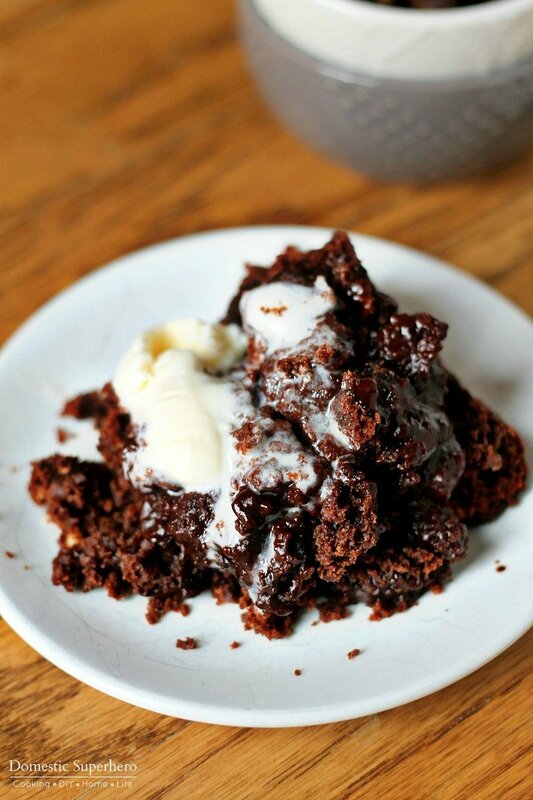 I was right when I told you this is the BEST chocolate lava cake you will ever make, and you barely have to do anything!!! Spray the inside of a 2 ½ quart to 5 quart slow cooker with non stick spray. In a large microwave safe bowl, melt the butter and chocolate in the microwave in 30 second increments, mixing between each increment, cooking until melted (shouldn't be more than 2 minutes). Adding to the butter mixture, whisk in 2/3 cup of sugar, 3 TBS of cocoa, vanilla, salt, milk, and egg yolk. Add the flour mixture and stir until thoroughly mixed. Pour the batter into the slow cooker and spread it evenly. In a medium bowl, whisk together the 1/3 cup sugar, 1/3 cup brown sugar, 1/3 cup cocoa and hot water until completely mixed together. Pour the mixture over the batter in the slow cooker. - DO NOT MIX. Cover and cook for 2-3 hours on HIGH, checking at the 2 hour mark. The cake should look done, and the sides of the cake will be away from the sides of the slow cooker. The larger your slow cooker, the shorter the cooking time will be. *I cooked in a small 2.5 quart slow cooker and it took exactly 2 hours. Remove the top, be careful not to drip water from the lid onto the cake, and allow to cool for 30 minutes. Serve topped with ice cream or whipped cream. I’ve never made dessert in my slow cooker before, but you’ve inspired me to start! This looks SO GOOD! Thank you so much, Crystal! I would love to share your post on my social media! Scheduling it right now! Thanks for including me! 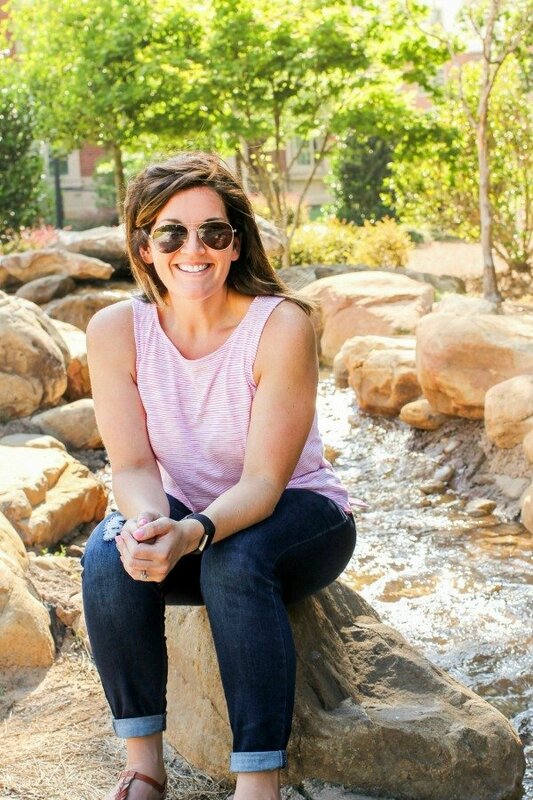 You should come back and link up today at my link party! I HAD NO IDEA!!!! I missed it! Maybe I will make up for that tonight, haha. You are right now, this cake would be divine with some wine! Yes, you might want to cook it a little bit longer. I can’t really say because I haven’t tried it, but I think it could be done! I first came across this while looking for chocolaty desserts to make for Valentine’s Day. Even added it to my 12 affordable ways to say ‘I love you’ post. So now I’m ready to try this and I can’t wait. 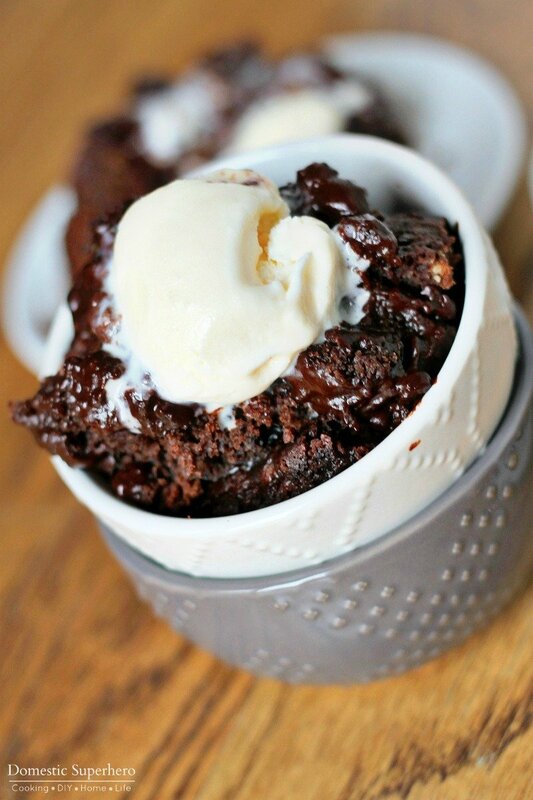 Chocolate and slow cooker…oh yeah! 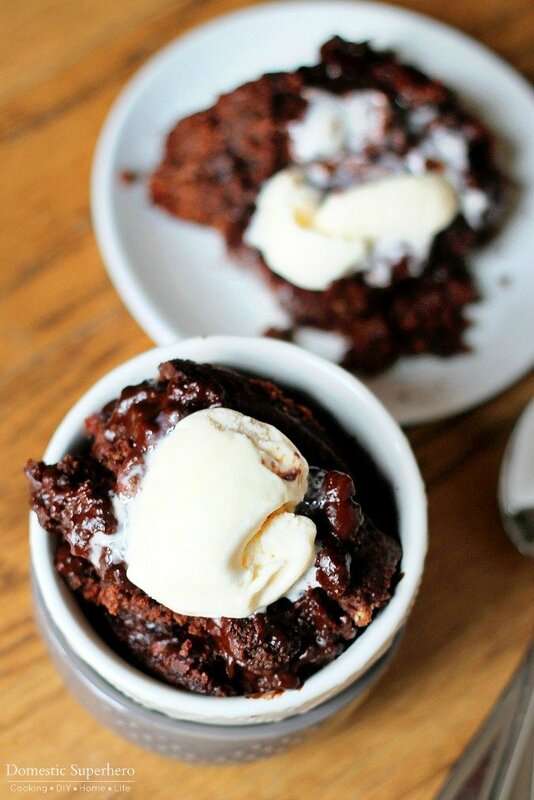 Thank you so much for this insanely chocolatey recipe! We are going through a major kitchen/LR/DR remodel, so we are relying on the crock pot and Instant Pot and grill for meals…no oven. I needed a crock pot dessert recipe for my daughter’s 18th birthday. For dinner, I made an Instant Pot pasta recipe that kind of failed (burn light went on, pasta was stuck to bottom of pan yet not cooked yet — auugh! I should really read the user manual…). This delicious and easy dessert saved the day! 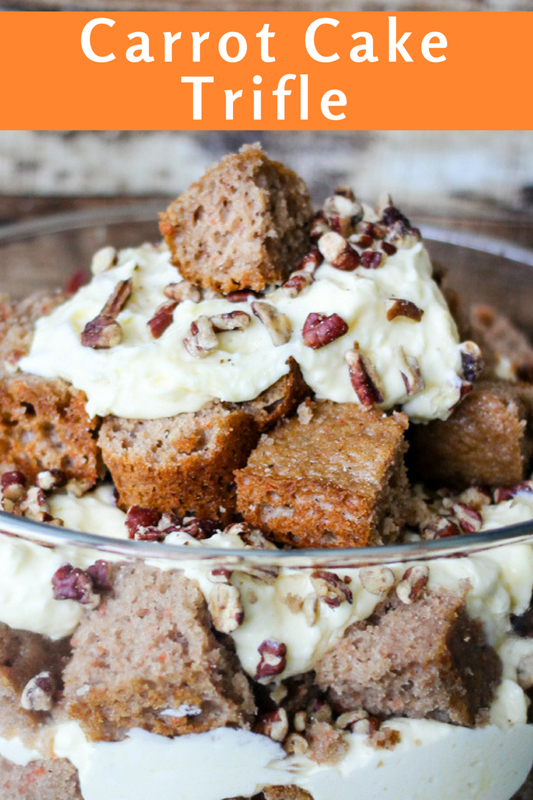 My family seemed a little dubious about a crock pot cake, but they *loved* it! My daughter was so happy to have a yummy dessert on her special day. (In case you’re wondering why we didn’t take the girl out to eat for her 18th, she had been out super late the night before at prom, and just wanted to sleep and relax all day.) I followed the directions to a T and served with lots of vanilla ice cream. Yum!! WOW!!! I am SO happy it turned out great for y’all! We went through a kitchen remodel last year and lets just say, I know how you feel! I have lots of instant pot recipes too, that are seriously delicious and will not give you the burn notice! You can check them out here! Good luck with the rest of your remodel and I hope everything goes smoothly!